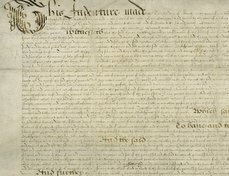 This is the foot of fine, one of the three copies of the final concord ratifying Shakespeare’s purchase of New Place in 1602. It has been filed with other Warwickshire “feet” among the records of the Court of Common Pleas since 1602. 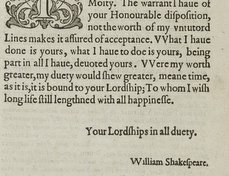 Shakespeare's name appears in the middle of the fifth line (in the accusative case) as "Will[elmu]m Shakespeare gen[er]osum" (William Shakespeare, gentleman). The text is in Latin and is written in a style of handwriting used solely for Court of Common Pleas documents. Most legal documents that transferred property consisted of three copies: one for the buyer, one for the seller, and one for the court. For final concords, the agreement was copied out three times on a single membrane of parchment, which was then “indented,” or cut apart along wavy lines. In case of future disputes, they could be fitted together again to prove their authenticity. The final concord of 1602 is remarkable for the fact that all three copies survive. 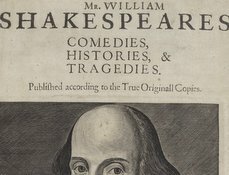 The buyer and vendor copies are in the Folger Shakespeare Library. Shakespeare purchased New Place, one of the largest houses in Stratford-upon-Avon, from William Underhill in 1597. Shortly after the sale, Underhill died, apparently poisoned by his eldest son, Fulke, who was prosecuted for the crime and hanged in 1599. Fulke's estates reverted to the crown until his younger brother, Hercules, came of legal age in 1602. 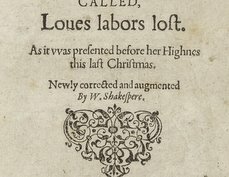 In that year, Hercules confirmed the sale of New Place to Shakespeare, probably arising out of Shakespeare's concern to protect his investment. See Shakespeare purchases New Place for further details about the 1597 and 1602 final concords.